The cavernous interior of Annie's, the seriously queer steakhouse, has been updated but the comfort food menu of huge fries and steaks and oversized salads remains unchanged. Upstairs is now a swanky lounge. 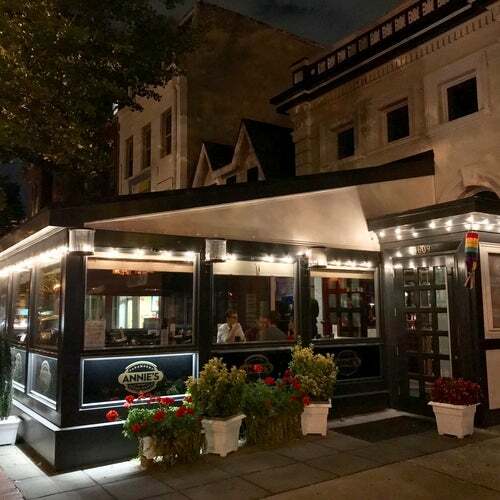 Make sure to take in a D.C. tradition here: Get a table in the front room with the expansive view of the gay crowd that cruises up and down 17th Street. I had the misfortune of visiting this establishment as a straight non white male in our nations capital. I was made to look like a fool and humiliated in front of all the other customers who were all white in the restaurant. I had just checked in to my hotel room 30 minutes before and asked the hotel for some recommendations to eat and they mentioned Annie's was close by. I walked 3 blocks over in about 34 degrees temperature and sat down in the restaurant. When i asked to be served from the menu they refused claiming I was drunk (which i was not). I asked why and they stated i had "stumbled on my way in"and concluded in was drunk. I was stunned and humiliated as all the customers in the nearby tables could hear the conversation. Realizing that if i caused a scene they would call the authorities and haul me to jail. I calmly waited a few minutes and as i left the building i told the waitress she was out of line. I went back to the hotel and told them what happened. they followed up since i was one of their best customers (highest level in their hotel loyalty program) Decide for yourself was this racism, reverse discrimination since i found out later this was a popular gay hangout or maybe because i looked poor. I have been coming down to DC for 15+ years and Annie's is always my # 1 stop. The place serves a good mix of comfort food in a warm, relaxing environment. Every time I go it is like a family reunion. How tired is this place? Ate dinner and bar are smelled like sewage, tlked to manger told me i was an idiot. On the 30th I went to Annie's with an acquaintance based on his recommendation. I had been there before, but never have really taken by this place. Once, a couple of years ago, I made reservations for Sunday brunch and when an extra person called me to attend, there were five of us, I was not given the extra chair so I had to sit on the edge of the a friend's chair. Neither of us was comfortable, after that event, I didn't return until the 30th. The french fries were over cooked, so it was the steak and it was not the Cajun style flavor. In fact, it was flavorless. I will not return. Expensive for the quantity and quality you get -prices are even more expensive than the ones given in the internet. $15.50 for a chicken Caesar salad with very little salad and over-salted chicken is definitively too much. The waitress was friendly enough, but couldn&#039;t explain the different kind of beers offered on the menu... And there weren&#039;t that many! point: you get to see every one walking up or down the street if you&#039;re sitting next to the windows under the veranda. From salads and seafood to burgers and steaks, Annie's has been serving up consistently decent grub and friendly service for more than 60 years. It is also one of the few restaurants in DC that is open 24-hours on weekends. The main negative is that it is slightly over priced given the average quality of the food. Scott makes the best Bloody Mary in town! Ask for it to be SPICY!! Cool atmosphere, excellent food, hot area! I look forward to brunch at Annie's during each trip to DC and I've loved it for over 20 years. Annie's continues to improve. The diversity of the clientele, the gay centered approach, and the prices are great. The eye candy from the windows is also great. the last time was not so good. The food was ok, but a little on the pricy side for what you get- even in DC. The thing that turned my partner and I off the most was the horrendous service. Rude, arrogant, we had to ask for everything like refills, sauce, silverware, and the check. We haven't been back since. Shame too, I remember some very nice experiences there. Great place, comfy and good food. Decided to give Annie's a try after reading the reviews. Short and simple, service was terrible and food mediocure at best! We had to question whether this was the waiters first night! He approached the table not really knowing what was on the menu or how to handle himself as a waiter. (Sat down to take our order!) When the food arrived, he felt it necessary to hand the plates to us instead of placing them on the table???? Strange! We watched his actions with other customers and it was the same. As for the food, salads tasted as though they had been pre-made sitting in a fridge just waiting for it to be pulled for the next order. Steaks and prime rib were tastee but in all accounts overpriced! Definitely not a pleasant experience and won't be recommending this establishment. Stay away, your money can be better spent elsewhere.